It’s been four months since you wearing a new watch that you already see a couple of scratches and dust on its glass; at the same time, you feel itchiness around your wrist. You take off your watch, wipe the glass and the strap with a clean dry cloth and put it back on. Now, this becomes an endless routine and you wonder why you are wearing a watch which keeps you in discomfort. In a couple of months, your watch stops working and you will have to head to the repair. Why go through so many trouble? Here is, perhaps, the best answer to your question. 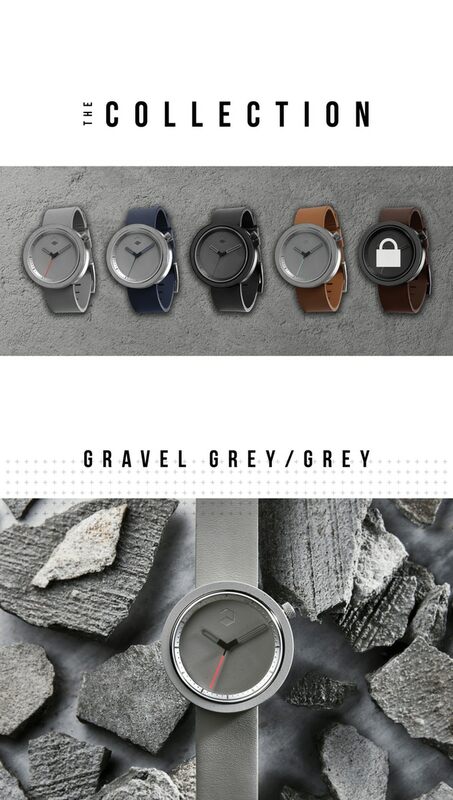 Presenting the Masonic Watch by Aggregate Watches. The watch case has a 316L low carbon stainless steel for corrosion resistance. 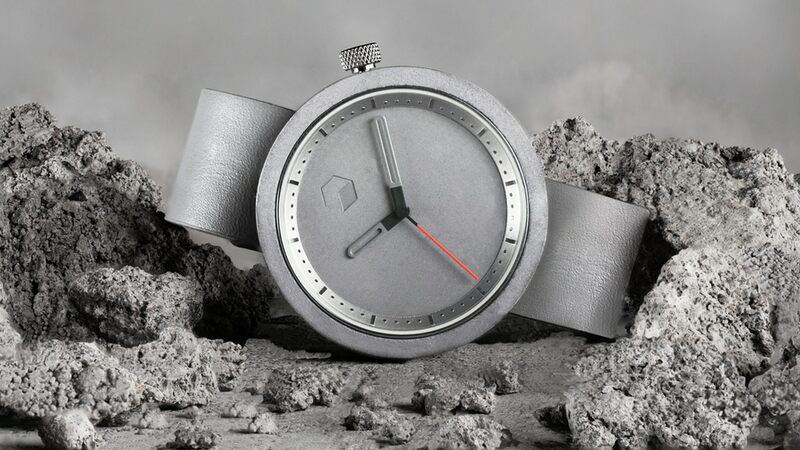 Its bezel and dial are made of concrete from a proprietary cement blend. it’s got a scratch resistant sapphire crystal lens. The crown of the watch is made of stainless steel which is repositioned at 2 o’ clock to provide texture for easy adjustment. The strap is a one piece made of top grain leather and is interchangeable to colors such as gravel gray, Pacific navy, charcoal black and bay brown. It also has a removable back casing which is laser etched. The Miyota 203A quartz movement runs on its processor. You can tuck the one piece strap into a stainless steel buckle. The strap length width is 240mm, 20mm respectively and it weighs around 90g. Concrete is incorporated as a design to provide durability and light weight for daily wear. It experiments with concrete in an unconventional and minimalist way. The attention is more on color and details of the material than its form. The designers have come together to manufacture a watch which displays elegance in design yet maintains clarity. Apart from its regular function to display time, it doesn’t serve other purposes such as showing your activity for the day or displaying a map within the watch. It’s not a smart watch, after all. Therefore for techies, it doesn’t seem competent enough for the smart watches such as the apple iWatch and Samsung smart watch. With the similar price, the iWatch has a dual core processor. It can track your movements, make you meet your exercise goals, count your calorie intake and maintain your health. One other feature The Masonic watch lack is to link it with another device which makes it unable to connect to your cell phone or make calls. The Samsung gear watch runs with 512 MB of Ram since it can run applications on it. Thus, the Masonic watch will meet your heed only if it has to display time. If you want to opt for a watch which offers applications, then the apple iWatch is recommended which is an expensive but well-worth. Customer review — Thoughts and Suggestion. Since the watch isn’t available in the market, there aren’t many reviews or comments by the customers. The comment section of the product page displays enthusiasm for the product by a couple of customers. some of them were a little skeptical about the color since two pages of the product showed two different colors of the navy blue that the company offers but, the design team has been sincere by replying to its customers and answering the most question asked. Some customers also propose a better design for it future watches to which the team has responded positively. You can learn more here. Overall, Masonic Watch satisfied three main purposes of a watch — simple design, durable & quality, lightweight and comfortable. Not to mention, the creator also offers a one-year full warranty upon the purchase. The company is based in San Francisco, and have years of passion in creating a good watch with excellent quality. Each design shows the tear and blood of the designer to make you stand out in the crowd. The Masonic watch is now available on Kickstarter starts at only $99, below is the link for latest pricing and availability. The quality is limited.